Colombian Military Want More SIkorsky Helicopter. 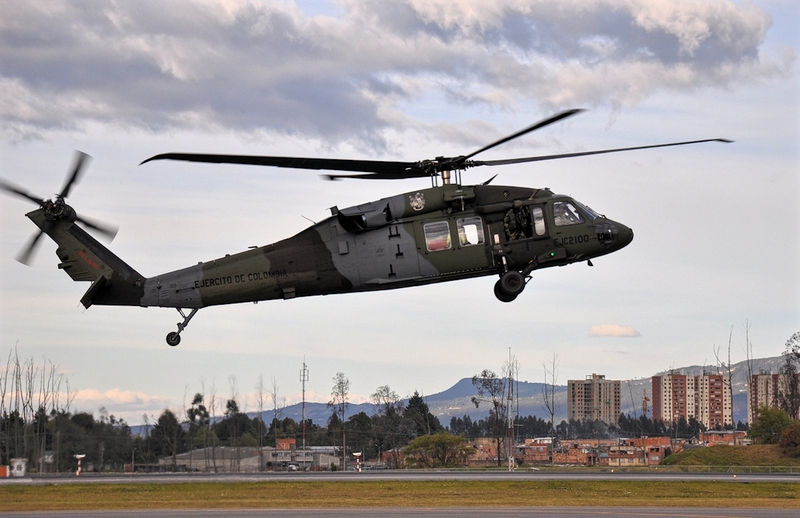 The appetite of the Colombian air force for the Sikorsky UH-60 Black Hawk has not diminished five months after the Bogotá government signed an agreement that ends a 50-year conflict with the FARC guerrillas. "I hope we have enough budget to continue acquiring this helicopter," says General Carlos Eduardo Bueno Vargas, speaking on April 4 during a press conference in Sikorsky. Colombian military and police forces now operate 103 Black Hawk helicopters after receiving the first in 1988, including the only armed Arpia gunship in the air force. The medium-range aircraft played a key role in the government's campaign against FARC guerrillas fighting in Colombia's mountainous jungles. FARC forces referred to the Black Hawk of the Air Force as "the Witch," says Vargas, using his vertical lift capacity to silently reach unexpected places. "I'm sure Colombia will continue to improve these capabilities," he says. Sikorsky plans to deliver another six Black Hawks to the Latin American region later this year. The first batch of three Black Hawks S-70i ordered by the Colombian Air Force will be delivered in August, followed by a second round of deliveries in October.